I’m sure you’ve heard of ‘pet days’? Well, during winter and early spring, when we can’t expect many warm days, we can always look out for the occasional sunny one. You’d be surprised how many there can be. Even apart from the occasional ‘pet day’, with the wonderful all-weather clothing that’s now available, it’s always worthwhile just getting out there. 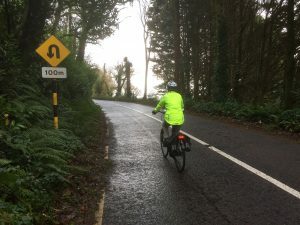 The rewards in terms of mental wellbeing, not to mention the obvious physical benefits, are just incredible when you make that little effort to take out the bike. 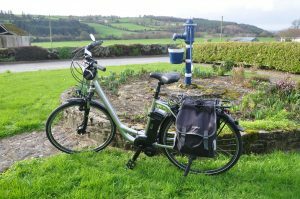 One of the benefits of an electric bike is that it is always easier to motivate yourself to get going, as you know that you can choose to make it easy for yourself if you’re not feeling in top form. Chances are, once you get going, you’ll end up going much further than you thought you might. Here are two little journeys we took recently on fairly chilly days. 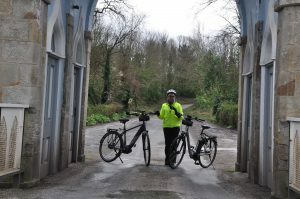 This was a short journey that was unexpectedly lengthened by finding what just may be Ireland’s shortest and most secret Greenway! Feeling a bit lazy after Christmas, we thought the 18km trip from Farnanes to Coachford, up and over a steep hill, would be quite enough. 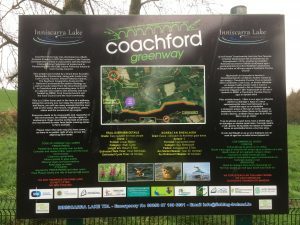 However, you discover things when you’re out and about and we discovered another of Cork’s great secrets; the Coachford Greenway! Admittedly a bit shorter than 6km in all, it was really charming as it follows the Inniscarra Lake with views across to the National Rowing Centre in Farran Woods. 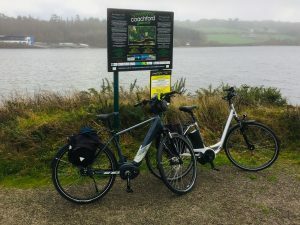 It extended our cycle to a relaxing 25km and with quiet roads, a good surface and coffee at the Centra in Coachford to break the journey, it was a good choice for the dull and misty day that was in it. This 35km circuit was just lovely for early February. 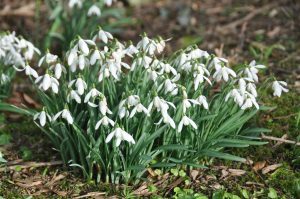 We started in Clashmore in Co. Waterford, not far from Youghal. 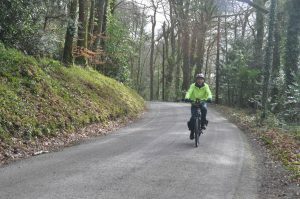 We took the back road (R671) to Aglish – quite a steep and long hill, but enjoyable on the electric bikes of course! 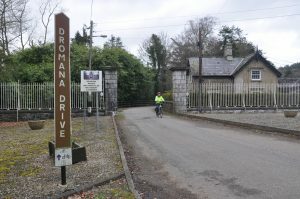 Villiarstown was our next village and then along the delightful Dromana Drive to the extraordinary Dromana Gate. 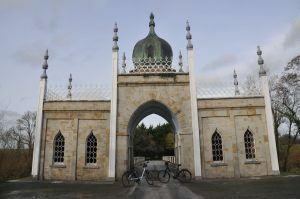 At the main entrance to Dromana House and Gardens, this gate is a combination of Gothic and Oriental styles of architecture. It was built in 1826 to welcome home the owner and his wife from their honeymoon. Originally constructed from wood and papier-maché, the couple were so enchanted that they had it reconstructed in stone in later years. Flashes of sunshine now and then were very welcome, but the discovery of new villages and meandering roads really made our day. You need to be self-sufficient on these little forays, so bringing a picnic in the panniers is always a good idea. If you come across a coffee shop, it’s a bonus, but it’s better to bring something. Remember, that will be the only fuel you’ll burn!